My wife and both kids have got their [tag-tec]Wrath of the Lich King[/tag-tec] beta keys, but not me. Sob. Guess I’ll just mooch off their accounts. Mwahahaha! 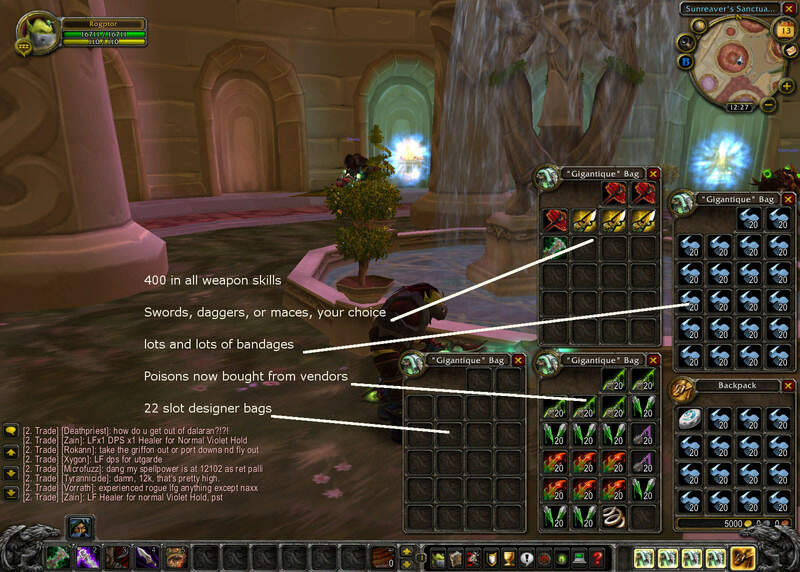 If you have your beta key, you log into the WoW Beta page, pick the copy template option, and go from there. You’ll land on a page which gives you two choices, one ally, one Horde, for each class in the game. You can pick any three and it takes about a day for them to copy over. There’s an interesting glitch, though. Apparently, and I assume this will be quickly fixed, some classes have invisible gear. The female Blood Elf Pally, for one. There are others. The gear is a mix of blue and purple, so this isn’t a maxed out character. PvE geared characters are not available. I assume this means they want to test the PvP system, right? Well the instances are open (and Rogues don’t need a key,) but the battlegrounds and arenas are not, at least as I write this. Being beta things will change and then change again. If you’re wondering… I went with a Shadowstep build on this one. The world server is down at the moment, so I don’t have exact numbers, but it’s a pretty basic build. 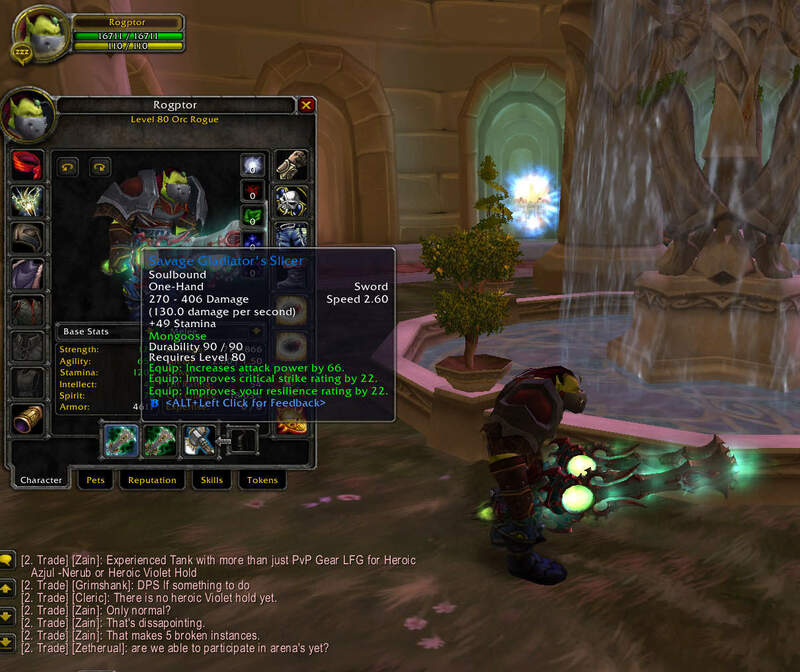 You can hit the level 80 WoW Talent Calculator here and play around with builds. You do start with some stuff and some nice bags. Haris Pilton, in Shattrath, sells the Gigantic bags at a Gigantique price. 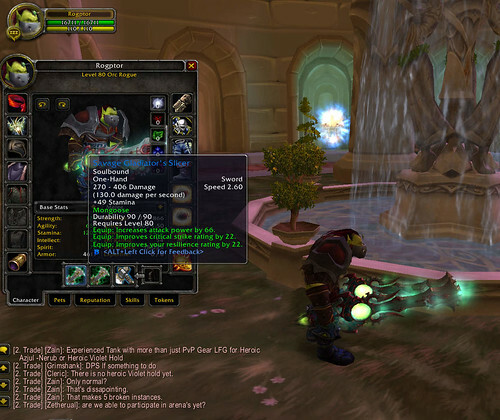 Here’s a screenie of the Orc Rogue with bags. 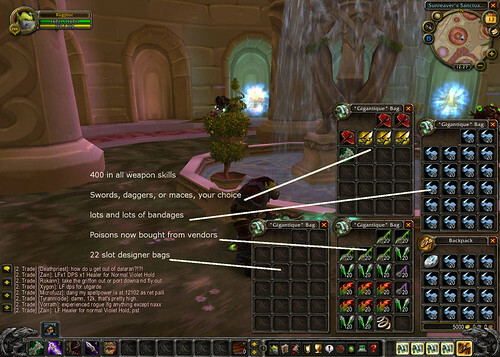 Note the bandages (heal 5800) and the poisons, which are now (will be) bought from vendors. No more flash powder for your Vanish, either. Naturally, when Wrath goes live all beta characters will be deleted. Still, this gives us a good chance to play around with talents and see what gear will be coming. Deathknights are a lot of fun so far, so that one will be next. After that, we’ll see. I expect all the new talents and everything DeathKnight will be significantly tweaked between now and release, so take all beta info with a hefty lump of soothing spices.